We’re up to Shin Sekai Yori’s third episode and, while this one isn’t as action packed as the last episode, we are getting closer to some answers and are really getting a feel for what this series is moving towards and what it’s all about. Take a seat and let’s talk about what happened this week and get excited for what should be a very informative and insightful episode 4. Don’t make the assumption that just because this seems to be a set-up episode that there isn’t anything to see here: we get some very good moments and an interesting insight into what Saki is capable of. As with each episode intro, we’re given something that happened in the past that contributed to the state of the world that Saki and the others live in. This episode’s intro even treated us to a big stylistic change reminiscent of Dead Leaves and Gurren Lagann’s look that Gainex is so famous for in showing us an the assassination of one of Japan’s top leaders about 400 years prior to the series proper. 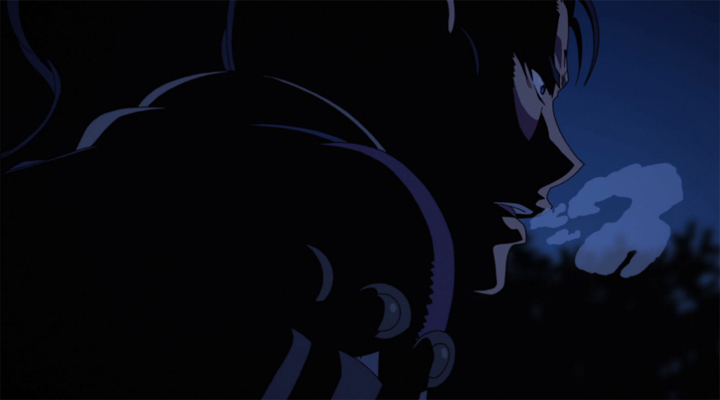 Opposite of the rest of the episode, there is fast action and explosions leading up to the final battle between this assassin and his target. What does this have to do with Saki and the others? This is where Shin Sekai Yori shines: substance and lack of context to keep the viewer guessing and theorizing. It’s all up in the air right now and taking stabs in the dark at where this is all going is more than half the fun. 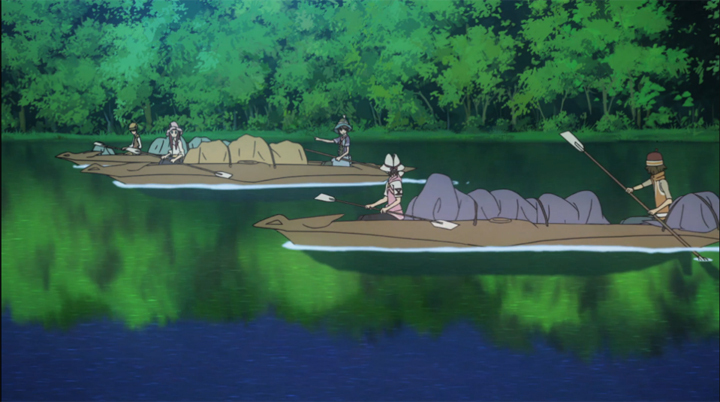 After that intense scene we are brought back to the present with Saki, Mamoru and the others on what’s only referred to as an “important” canoeing trip down the river. They travel by day, land in the afternoon, set up camp, and cook up some grub. Sounds like a normal vacation to me! Night sets and the group sits around the campfire while Satoru begins telling stories with no reputable source, something he obviously loves to do. He regales everyone with a recounting of someone coming across what’s called a “Balloon Dog” that puffs itself up to scare off predators until it explodes. He moves on to another similar story about people running into something called a Demon Minoshiro in the mountains. He explains that anyone who runs across it dies soon after. Everyone brushes the story off as typical nonsense and they head out for some night boating. The kids admire the stars and talk about how much animals have changed in the past 1000 years and that things are very different than what they used to be. The next day the kids set out exploring, coming upon an old, shabby shrine. But that’s not all they find. Saki and the others come across a Demon Minoshiro, a small translucent, prismatic horse-like creature that grows a few protrusions and gives off a stunningly bright light. Everyone is paralyzed by the creature, except Saki. 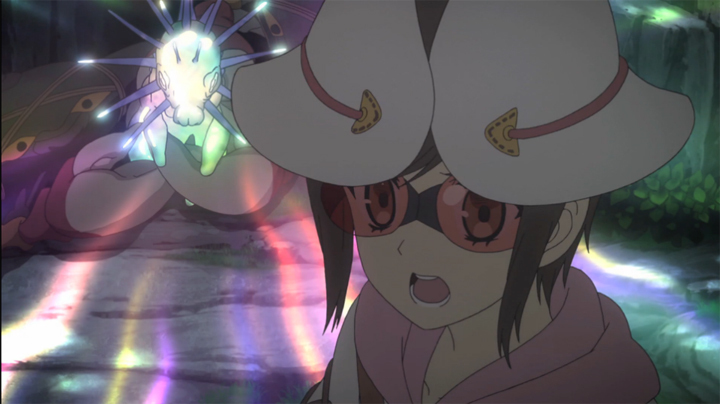 Once the creature gets away, the kids realize that they couldn’t move, but Saki was partially immune due to her sunglasses blocking the effects of the Demon Minishiro’s light. Saki and the crew are now intensely interested in the Demon Minoshiro and set a plan in motion to capture the creature. After some work, they finally find the creature. Saki tries to make it stop with the paralysis lights, but it’s resistant. Saki shows she means business by proceeding to use her Power to rip out the protrusions on its head that seems to be giving off the light. Saki has shown that she will use her Power when someone is in trouble and this is no exception. I will say I was taken off guard at this moment for her to do something so violent, though. The creature eventually gives in, turning off the lights and setting the kids free. The Demon Minishiro reveals that it isn’t that at all; it’s a mechanical library filled with petabytes of history and knowledge. What can Saki learn from this discovery? Oops, the episode is over and we’re waiting ‘til next week! Not counting the opening, this episode was very slow moving with very little explanation of what exactly the kids were doing, but the last third of the episode really brought me out of my haze and back to the edge of my seat hoping for answers. So far the series has been all about mystery and keeping you guessing, making you wait and anticipate, and this episode’s ending was really hitting that idea home. If you’re not hooked by the characters yet, then you’re going to be hooked on the concept of “What happens next?” Shin Sekai Yori is also not shy about switching things up, jumping from the past to the present, or changing the art style as we go along. It keeps things fresh and your eye on the screen. I’m enjoying the show so far with all the interesting twists and the tone that Shin Sekai Yori has to offer. While episode 4 seems like it could give us a lot of good answers, I don’t expect the mystery to end at all. If anything we will somehow walk away with more questions than knowledge. Next Post:Girls und Panzer, Episode 2: Tanks, We Ride Them!